Check out The Live Piano Experience at this awesome venue! The Church and Friary of St. Francis, as it is also known is available for your wedding whether it be religious or civil. Designed by Edward Pugin and built between 1863 and 1867 it really has to be seen to be believed. In fact it not actually a monastery at all (a place where monks would live) but it is a Friary (a place where friars would live) and it was open for worship until 1989. After closing its doors it fell in to disrepair with the doors being broken in and many of the treasures inside being ransacked. In 1997 the World Monuments Fund designated the Monastery of St Francis as one of the 100 Most Endangered Sites in the World along with the Taj Mahal and Pompeii and a restoration fund was started. 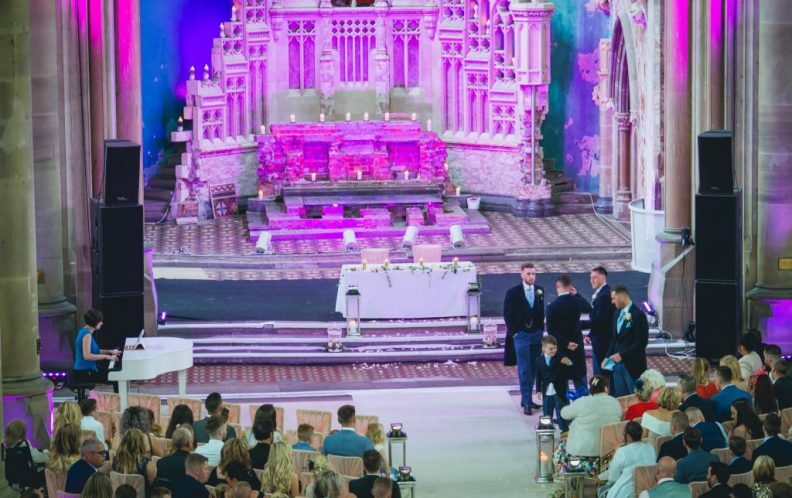 After many investments and lottery funding applications, work was undertaken to make an amazing wedding and conference space comprising of The Great Knave, The Victorian Pantry, The Friars Gardens and most recently the amazing Welcome Wing. Set on the back drop of the original alter The Great Knave is a fantastic place to hold a ceremony. Capable of holding unto 450 people and all up lit with changeable coloured lighting it makes for memorable walk up the aisle. 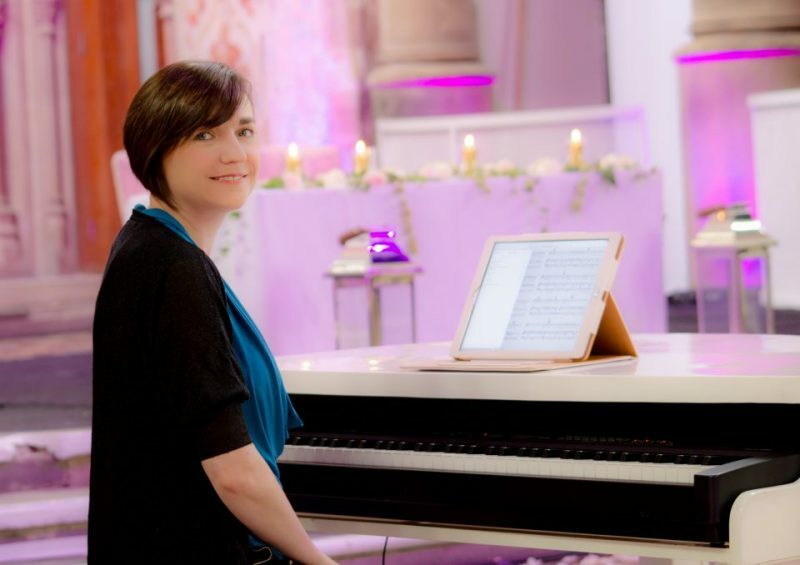 Seen in this picture is Liz Hendry – Wedding Pianist playing one of our white baby grand pianos for the Bridal Entrance of the soon to be Mrs Dyer. Notice the large sound system provided at great expense by the venue. The sound design has been set to maximise sound clarity and quality in such a large room. Our first visit to the Monastery was for the wedding of Michael and Hannah Sethna. They won a competition that we ran for their wedding entertainment. 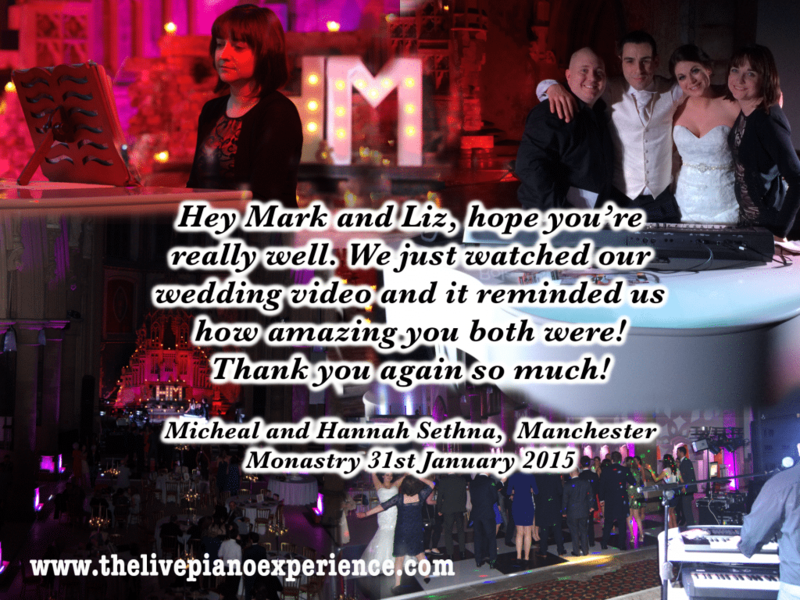 We provided instrumental music during their ceremony and wedding breakfast and then for their evening entertainment they had one of our awesome party band packages called Mark Hendry’s Live Piano Experience. The sound was amazing in there and the guests packed on to the dance floor. 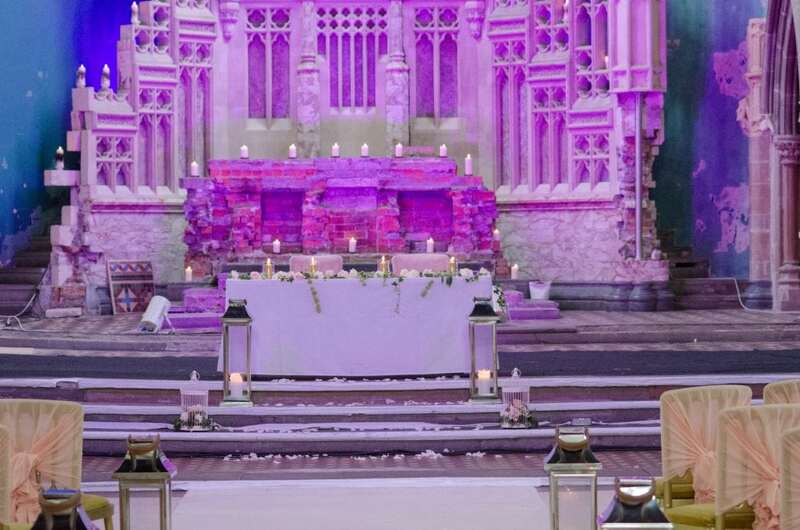 If you are looking for a fantastic, historic, Manchester wedding venue then we can recommend this one. Check below for details of how to contact their fantastic team of wedding experts who are dedicated to guiding you through the day and making it perfect – and of course don’t forget to book The Live Piano Experience to provide the complete soundtrack to your most special of days!